THE ORIGINAL . . . . . THE BEST . . . . . 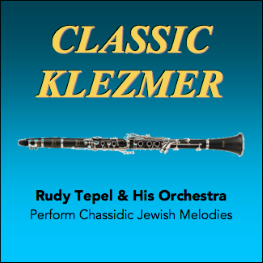 Listen to and watch Rudy Tepel and His Orchestra, one of the most popular wedding bands and finest klezmer musicians in the country, directly on this website. From the first Rudy Tepel Orchestra, he has specialized in Hebrew and Yiddish wedding music and has for over 50 years achieved the reputation of leading the finest band for this kind of music in the United States, performing at over 6000 weddings, Bar/Bat Mitzvahs, and numerous other events. Rudy is proficient at clarinet, saxophone, and flute and has a repertory of over six hundred Chassidic melodies of various dynasties, probably the largest collection of such music written down for orchestra. His genial personality, lively antics, zestful playing and memorable tone have made him known far and wide. You can listen to or download each digitally re-mastered musical selection in its entirety by clicking the desired title below next to each album cover. To listen, left click. To listen to all songs continuously for a selected album, click play button on top controller or any title. All songs of selected album will rotate. To download and save, click title (if not already selected). Then click download arrow on top controller. Depending on your browser, you will either be prompted to save the song file or it will download automatically to your computer. We have a limited supply left of these recordings on CD, complete with a printed guide for each original record. If we can fill your request, each CD costs $18 plus $3 shipping and handling. If you are interested, please send your request to rudy@tepel.org. 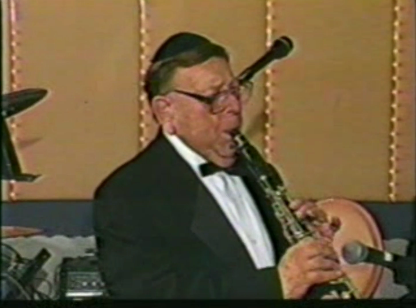 Click above to watch "Rudy Tepel: A Klezmer Legend"
Conducted in a casual environment over lunch on December 20, 1990, this fabulous and extremely rare conversation - interview features the voices of Rudy and Lucille Tepel offering an historical perspective and the origins of the early and formative years of Yiddish, Klezmer, Chassidic, and Lubavitch music and of the early Jewish wedding bands and musicians, particularly in New York. Rudy and Lucille share invaluable insights about the venues, music, customs, and cultures for the celebratory affairs they played at, as well as many of the great musicians at the time. Rudy also discusses how he came to be one of the premier bandleaders in the Jewish culture, starting with American jazz. Courtesy of and special thanks to Joel Rubin (joelrubenklezmer.com), who, with Rita Ottens, conducted the interview. 84 minutes. Audio Only. Stop and start as desired. If it stops mid-way, streaming may be slow. Click play/pause button back to play to continue. 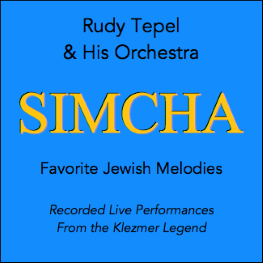 RUDY TEPEL AND HIS ORCHESTRA PLAY 21 DANCE MELODIES OF VIZHNITZ . LUBAVITCH .